Always a lot of excitement about the first warbler of the year sighted in Central Park, Tom's is actually the second reported sighting. On February 9 Angus Wilson reported a Pine Warbler seen near the King Jagiello monument at the East end of The Lake. 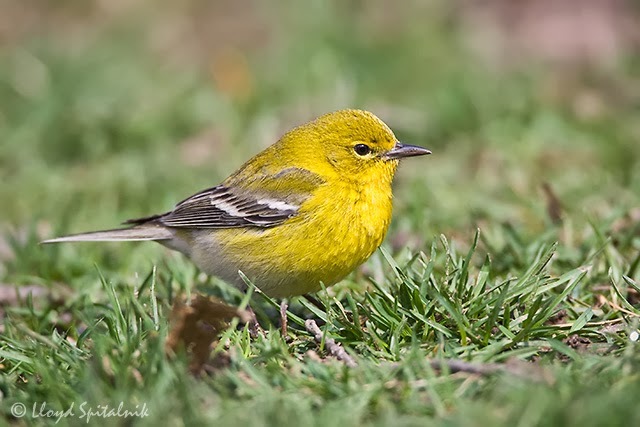 A surprise this mid-day - for the late-winter date (& have not seen any recent report of such), a PINE WARBLER, seen well and at very close range, at the "oven" area next to the Lake (a bit west of The Point) in the Ramble of Central Park (Manhattan, N.Y. City). This at about 12:45 p.m. & in company with many other birds, a great number of them White-throated Sparrows, as well as a miscellany of other typical park resident & wintering birds. The warbler appeared most like a female to my eye, and any further sightings would be of great interest, as well as any reports of this (or any warbler) over the past month & more. This is extremely early for an arriving Pine Warbler, & yet I am unaware of reports of one having been seen here this winter. A likely area to check in addition to the site it was seen in would be the not-far-off feeding station a bit to the north in the Ramble. When viewed, the Pine Warbler was actively feeding, and spent a bit of time on lingering snow, picking at what presumably was miniscule insect life there, as well as feeding from small branches & twigs. At the feeders, a brilliant adult male Baltimore Oriole as well as far less colorful female (or non-breeding male) Baltimore Oriole were seen, just moments before the warbler sighting. At least a modest number of birds had been moving in this &/or recent milder days, as there are now more American Robins about than in the days before the weekend, and also some Common Grackle movement on this & previous 2 mornings was detected. In addition at least 25 American Crows were passing by the park this midday. The path around the reservoir is now about 90% or more snow & ice free, while the reservoir's surface is still much more than 90% covered in ice. I scanned there for a short time seeking any uncommon gulls, or other birds but did not find any of special note. A number of Wood Ducks continue, this morning: 5 at the reservoir, as well as others scattered from the Lake and the Pond (s. end of the park). I also flushed (without intent) an American Woodcock at the n. woods earlier this morning. There may well be a few more of them in favored sites. And it isn't even Valentine's Day! First Central Park warbler of 2014! Where Are the Ducks of Yesteryear?